uuid : 96621606-0d9e-4a3b-b392-d9d93d70115d templates_id: 119489 templates_uuid: "e7672428-7273-4afe-9b7f-7ac1aeb1ec86" title: "Free Zero Hour Contract Template - 0 Hour Contract" display_name: "Zero hours contract" meta_keywords: "Nil hours contract and 0 hour contract\r\n" description: "
A clear zero hours contract is vital where a business wishes to hire casual workers as and when they are needed and are not able to promise a set number of working days or hours or any future work. A good zero hours contract will cover key areas such as the practical arrangements for how work will be offered and carried out, as well as clauses you would typically see in an employment contract like place of work, hours, holiday, pay and termination arrangements. Exclusivity clauses in zero hours contracts are now banned and unenforceable. A zero hours contract is an agreement between a business and an employee where the business does not guarantee any set hours for future work. It sets out such things as the type of work that will be offered, terms relating to pay and benefits and agreed hours and holidays. Why do I need a zero hours contract? A zero hours contract is useful when you cannot guarantee hours for employees or want them to have flexible working arrangements. Zero hours contracts are frequently used where the demand of work fluctuates, for unexpected or last-minute events, or for on-call/bank work. What is the difference between zero hours contract and employment contract? The key difference between a zero hours contract and an employment contract is that a zero hours contract does not require an employer to offer work or for workers to accept it. Are individuals on zero hours contracts workers or employees? Individuals on zero hours contracts can be workers or employees. This will depend on their employment status. Zero hours workers are entitled to basic employment rights such as annual leave, the National Minimum Wage and National Living Wage and pay for work-related travel in the same way as regular workers. Can an employment relationship arise based on zero hours contract? A zero hours contract creates a \'worker\' relationship. An \302\221employee\302\222 relationship may be developed over a period of time. In most scenarios, zero hours contracts mean that an employer recruits a \'worker\' at first. However, the way the working relationship develops over time may enhance the employment status of the worker. The zero hours contract reflects the intentions of the employer to only treat \'workers\' as such as not full-time employees. In some circumstances, if a dispute arises in the Employment Tribunal, it has the power to decide the contractual relationship that exists between the employer and worker. Is the worker under a zero hours contract eligible to holiday pay and/or sickness pay? A worker under zero hours contract is entitled to annual leave (holiday pay), sick pay and the National Minimum Wage and National Living Wage. They don\302\222t normally have the \"employee\" status, which would allow them to claim for unfair dismissal, maternity pay and leave, flexible working or statutory minimum notice. An employer has the right to end this agreement immediately in writing if a worker has committed serious breach of its terms or committed gross misconduct such as dishonesty, theft and misuse of drugs. A worker can terminate this agreement by informing the employer as soon as possible in writing that they no longer want to be considered their casual worker.
" created_timestamp: "2018-10-08 04:36:22.0" modified_timestamp: "2018-10-08 04:36:22.0" active: true created_by: 236 modified_by: 236 dcm_id: 349 url_slug: "Zero-hours-contract" meta_description: "Make a free zero hour contract using our step-by-step interview. Make your zero hours contract online today with our free 0 hour contract template. Use this sample zero hours contract to hire workers on a casual basis. This zero hours contract can be used to hire workers as and when required." time_to_complete: "30 minutes"
A zero hours contract creates a 'worker' relationship. An employee relationship may be developed over a period of time. In most scenarios, zero hours contracts mean that an employer recruits a 'worker' at first. However, the way the working relationship develops over time may enhance the employment status of the worker. The zero hours contract reflects the intentions of the employer to only treat 'workers' as such as not full-time employees. In some circumstances, if a dispute arises in the Employment Tribunal, it has the power to decide the contractual relationship that exists between the employer and worker. A worker under zero hours contract is entitled to annual leave (holiday pay), sick pay and the National Minimum Wage and National Living Wage. They dont normally have the "employee" status, which would allow them to claim for unfair dismissal, maternity pay and leave, flexible working or statutory minimum notice. More than just a Zero hours contract template, our step-by-step interview and guidance makes it easy to create your document. Easily create online, download, print and sign your free Zero hours contract in minutes. 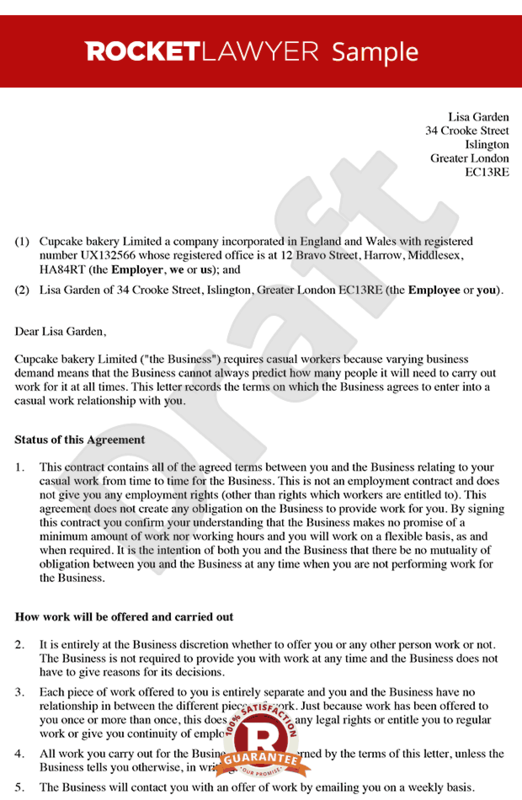 This document is also sometimes called: Nil hours contract and 0 hour contract .